Samos island in Greece. Pythagorion. Kokkari. Accommodation. Beaches. Many mistakenly believe that Samos belongs to the Dodecanese islands, but it is not. Samos belong to Eastern Aegean islands, together with Chios, Fourni, Ikaria, Lesvos (Mytilini), Oinousses and Psara. The two nearest neighbouring islands is Fourni and Agathonissi (which, however, lies in the Dodecanese). Samos is a large island with an area of 478 km2 and nearly 33,000 inhabitants. 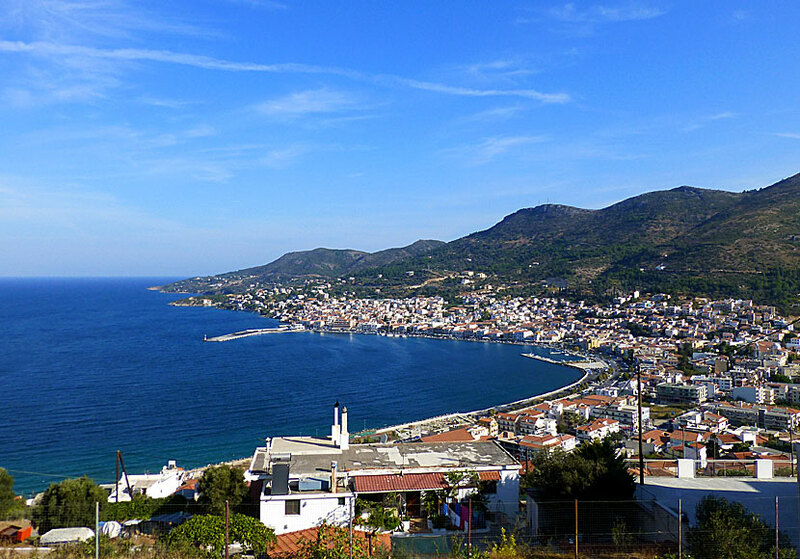 It makes Samos to Greece's eighth largest island to the surface, and the country's ninth most populated island. The highest mountain is Kerkis and is 1,440 meters above sea level. 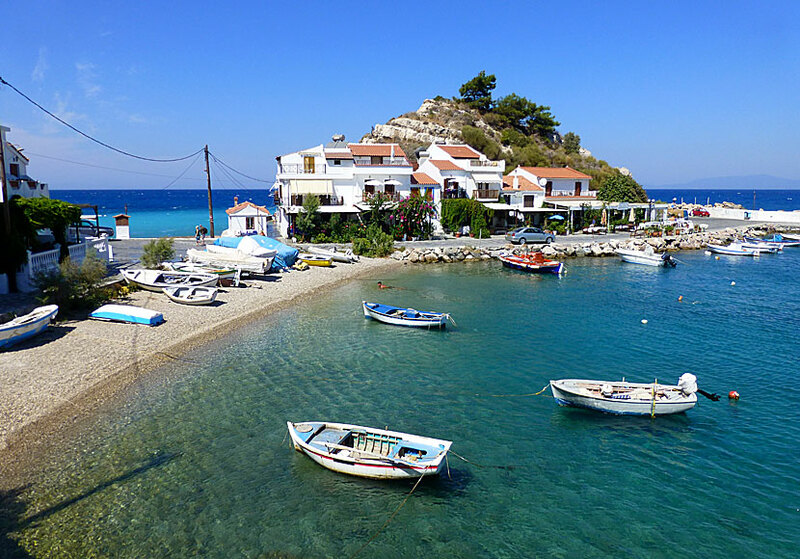 Samos has nice beaches, fabulous nature, tourist-friendly villages as well as genuine villages, nice hikes, good roads, waterfalls, interesting sites, good wine, good food, it is close to Turkey... 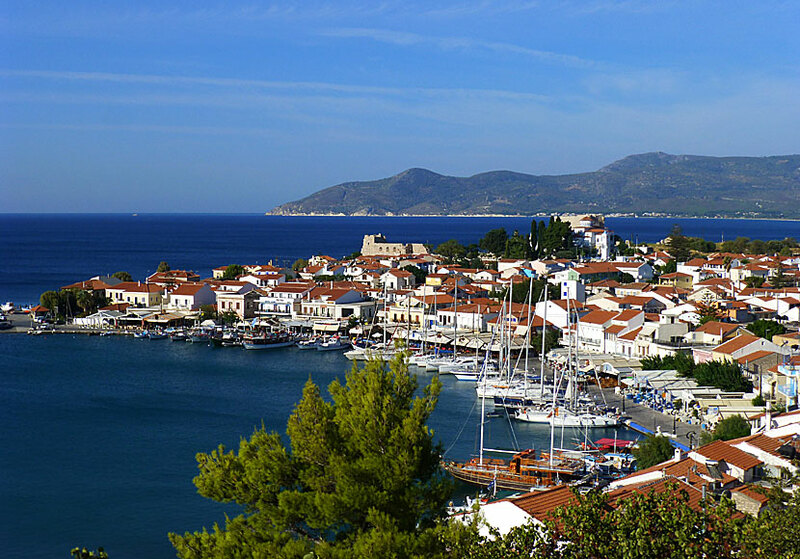 In short: Samos has something for everyone. It is hard to get tired of this island that see many travellers return year after year. Actually, some people I know have travelled to Samos for 15 years straight. Each time they stay longer, and they still claim there is more to discover. Samos is a very beautiful island, like here at Posidonio. What I think is best with Samos is the nature and the many fine country villages. Driving around the island is a delight, every minute is a pleasure. Those of you who've driven the road to the mountain village Drakei know exactly what I'm talking about. I also like Pythagorion very much, there is, among other things, one of the most cozy harbor promenades in all of Greece. Charter flights leave from all over Europe. If you choose to travel independently, it is easy to book a seat directly to Samos. 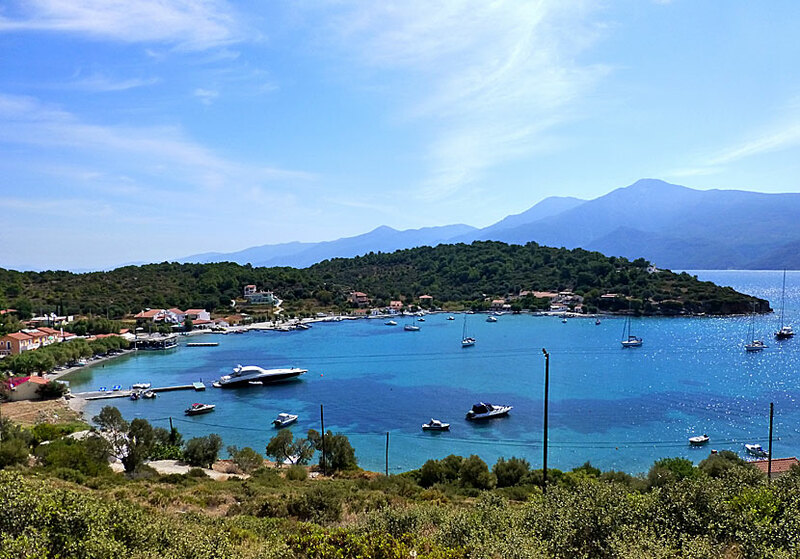 Boat travellers need to remember that there are three harbours: Karlovassi, Pythagorion and Samos town. Pythagorion port served by smaller boats such as Nisos Kalymnos,, and the bigger boats go to and from Karlovassi and Samos Town. Bus links are very good; you can go to most villages, and to the most popular beaches, with local bus. Excursion boats to the uninhabited island Samiopoula, and boats to the sandy beach Psili Amos 1, leave from the port promenade in Pythagorion each morning. The child-friendly beach Psili Amos 1. Samos is also one of the best islands to drive around. The roads are in good shape, and some of the parts have incredibly beautiful and dramatic surroundings. You can rent cars, mopeds and bicycles in the bigger towns. If you live in, or near Pythagorion, I can recommend renting a car, moped or bike at Nicos Rentals. 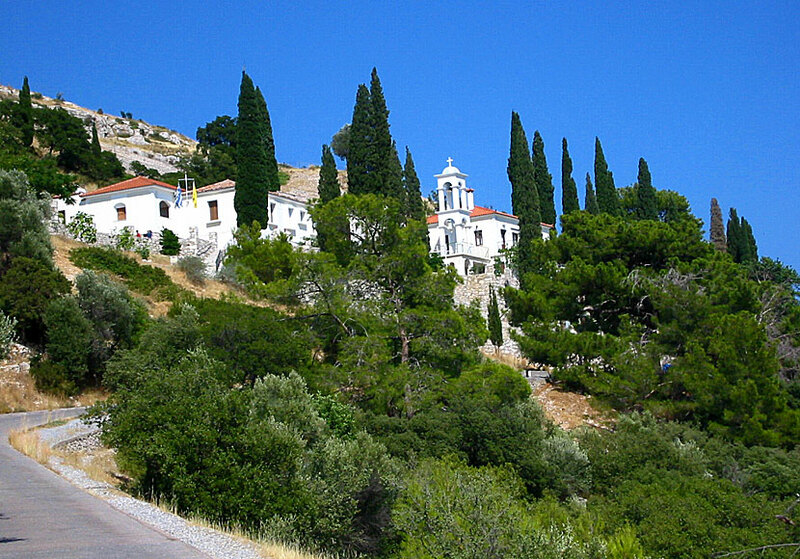 The island has many pleasant villages, and particularly the mountain villages is an important part of Samos' grandeur. One of these, Manolates, is by many considered one of the most picturesque in the entire Greek island world. Other lovely villages are Kokkari, Drakei, Kastania, Ireon, Chora and Mytilini, Pirgos, Abelos, Leka, Koumadarai, Marathokabos, Karlovassi, Kalami, Agia Paraskevi and Stavrinides. Balos is my favorite beach in Samos. Samos Town is the capital and administrative centre of the island, and have around than 6,000 residents. It is called Samos, or Vathy, and is a pleasant place with amazingly beautiful houses. I the winding alleys you will find small stores, ouzeries and kafénions. The archaeological museum is well worth seeing. Tourism has not been able to strike its claws into Samos town, at least not to the same extent as in for example Kokkari and Pythagorion. Samos Town, or Vathy as is the real name. Pythagorion (see picture at the top of the page) is situated at a horseshoe-shaped bay. And it offers one of the best harbour promenades you can find. You are surrounded by taverns and bars, and along the docks the big luxury boats lie beside sailboats, trip-boats and fishing boats. A pleasant harbour indeed. Even though Pythagorion is dominated by tourism, you can still find true Greek everyday life. In the alleys, where many Greeks have their homes, you find old men selling fish and vegetables and in the Greek stores the older women are sitting waiting for the customers to arrive. Along the main street lie several shops, travel agencies, souvenir stores, banks, and moped- and car rentals. You also find two beachs in Pythagorion: Tarsanas and Remataki. 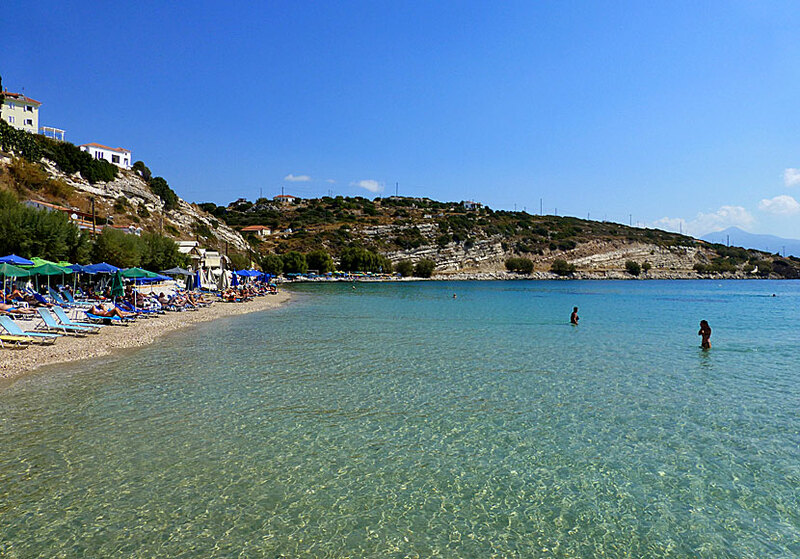 Kokkari is Samos second largest tourist resort after Pythagorion. The village is located on the coast west of Samos town. Along the very nice port promenade are tavernas and bars. 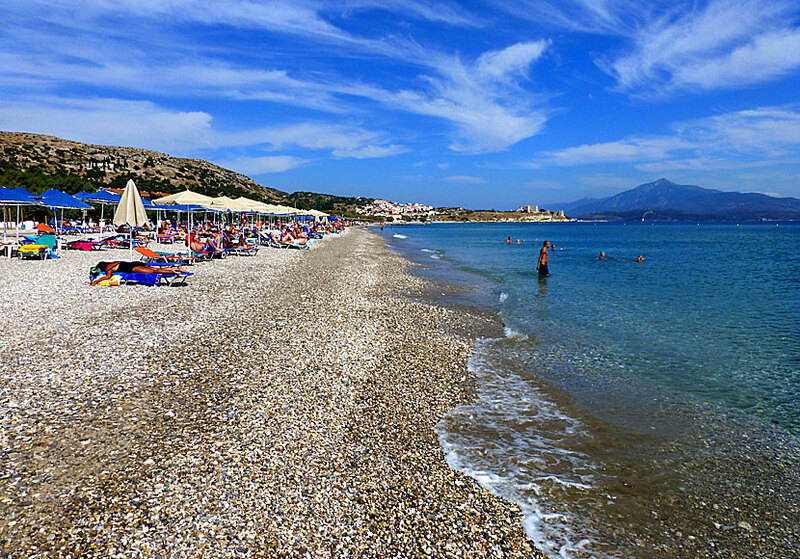 Also along the beach in Kokkari - consisting of pebbles - are several taverns, bars and cafes. The small peninsula in Kokkari is very beautiful and belongs to the most photographed objects on Samos. Votsalakia is typical holiday resort and has a 2 kilometres long sand and rubble-stone beach. The road to Drakei runs through the village. On the one side you have the beach and on the other lies small hotels, tavernas, mini markets and everything else that belongs to a package resort. Manolates is the village above all of Samos' villages and one of the islands most popular outings. It is situated 380 meters above sea level in a verdant long valley on the north side of Samos. The main road that runs through the village is like a dream. Perhaps a bit tourist-like in some places, but it does not get to you. Most of the stores sell art and pottery and many nice taverns lies in the village. Just must eat at Lukas Taverna when you are here. They serve excellent food and offers a fantastic view over the sea and the Nightingale valley. Samos has several nice beaches, both sand and pebble-stones. Here is a description of some of them. Other lovely beaches are Lemonakia, Tsamadou and Tsabou, Balos (my favourite), Kerveli, Limnionas, Mykali, Posidonio, Klima, Gangouo, Papa (good taverna), Ireon and Potami. Potokaki beach close to Pythagorion. 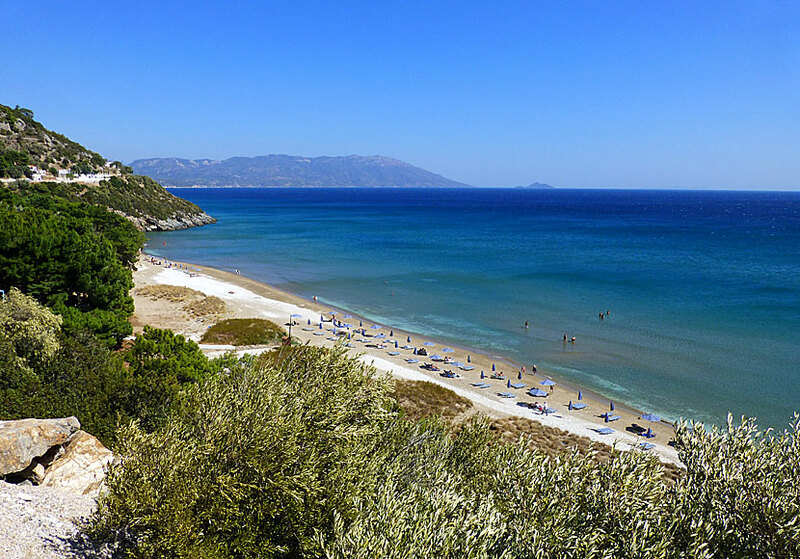 Potokaki is the longest beach on Samos lies next to the airport, a few kilometres outside of Pythagorion. It is truly a long beach; there are huge masses of sun chairs, but there still plenty of free space for you who prefer bast-mats, beach towels or air mattresses. The tree Tamarisk grows beside some parts of the beach and casts a pleasant shade on a hot afternoon. There are also some taverns and canteens. 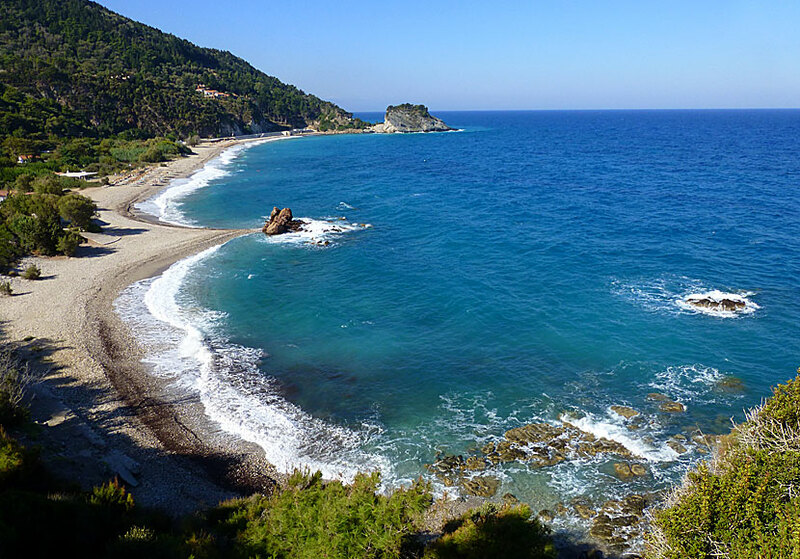 Psili Amos 1 is often called "The best beach of Samos", this is a place with many enthusiastic followers. For my part I find it heavily overrated. It is hard to move in the thick crowd and between the tightly packed sun chairs. But Psili Amos 1 is very good for families with small children - you have to walk far to reach deep water. Psili Amos 2 close to Votsalakia. Not far after you have passed Votsalakia lies Psili Amos 2. It is a long, fine beach with terribly shallow water. 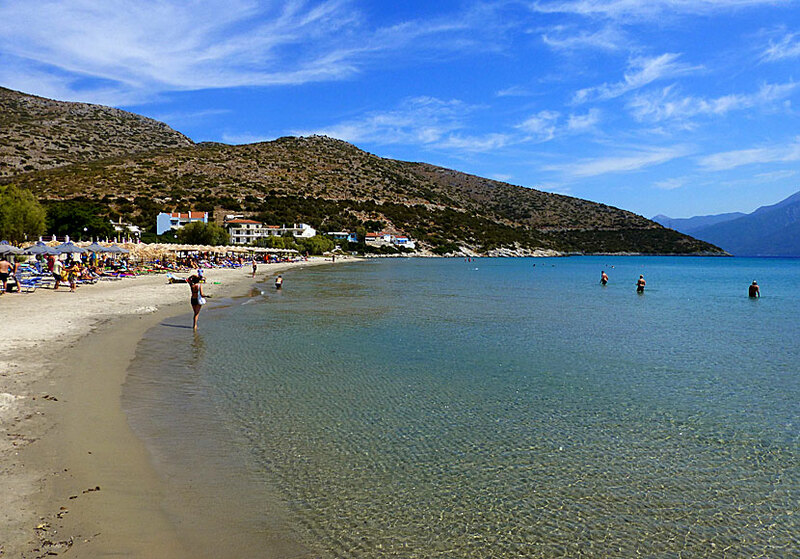 It is without a doubt the best of the "Psilibeaches" and perhaps the best on entire Samos. Few tourists, reasonably unexplored, fine sand, shallow water, and the bottom of the sea are lovely and visible due to the crystal clear water. The greatest sight on Samos is without a doubt the magnificent nature. Especially on the west side of the island. The mountain villages should also count as one of the main attractions. But mans hand has also made its mark on Samos, perhaps most strikingly when constructing the claustrophobically Eupalinos water-pipe-tunnel above Pythagorion. Other sights are the archaeological museums in Vathy and Pythagorion, temple of Hera close to Ireon, and the waterfall above Potami beach. Potami beach close to the waterfall. From the beautifully suited monastery Panagia tis Spilianis above Pythagorion you have a fascinating view over the town and Potokaki beach. The cloister garth is leafy and nice looking. Grand cypresses stand as proud Olympic winners by the chapels. Panagia tis Spilianis monastery above Pythagorion. To the left of the chapels lies a cave which hosts a strange church, which has given the monastery its name. The Greek word for cave is spilia. Down the stairs to the right you see the pretty little blue church, which at most have room for four to five visitors at the time. The cave is cool and perfect place to refresh. Have in mind that you should be properly dressed and cover your arms and legs when visiting the monastery. We always stay at Samaina Hotel when we visit Samos. It is an very good hotel located in a quiet area in the heart of Pythagorion. It is a family hotel run by the friendly family Gleoudis. The location is perfect: just 250 meters from the nearest beach and only two minutes walk from the center.